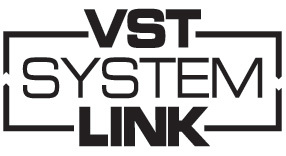 VST System Link is a network system for digital audio that allows you to have several computers working together in one large system. This revolutionary new standard brings true connectivity and platform independence to the digital audio world. VST System Link enables the transfer of synchronization,transport and audio data between two or more workstations equipped with compatible software and hardware over standard digital audio cabling systems such as ADAT, TDIF, AES/EBU or S/PDIF. Because it uses the audio stream itself, synchronization is completely sample accurate, even across multiple workstation configurations. VST System Link lets you take your audio projects to new levels of complexity, and offers unbelievable flexibility in your working environment. The first thing to check is that you are using the latest Cubase, VSTack or Nuendo version. There may be hardware which fails, because VSL relies in 100% data integrity (means all bits must be passed without any modification). This also means you must not attach anything that alters the digital data (like DSP volume/pan etc.) in the audio cards control panels (e.g. channel volume/pan in RME´s HDSP Totalmixer). Always use 32 Bit ASIO drivers. 16 Bit drivers will most likely not work. Some older ASIO drivers have different bit depths when using certain buffer sizes, e.g. when using VST System Link with RME Digi96/8 cards make sure to use 256kB (6ms) or 1024kB (23ms) ASIO settings. There are problems with some audio cards when using auto dithering and copy bit mode on their S/PDIF ports. We have checked VSL with Steinberg's VSL 2020 audio card, as well as with RME hardware, Hercules (16/12 FW), M-Audio Delta 1010, Event Layla 24. MOTU and Layla20 cards tend not to work reliably for System Link. Steinberg cannot influence this, so please contact your audio card manufacturer.